Townhomes on old Beer Store site. 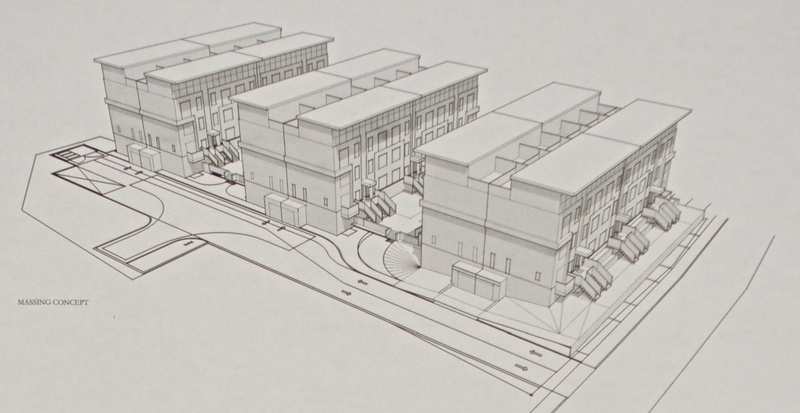 Developer’s impression of the townhomes with their single entrance and exit on Weston Road. On Wednesday evening, approximately 25 residents witnessed a presentation from architect Alex Boros and developer Jack Morelli hosted by Councillor Frances Nunziata. The topic was the dismal site at 2059 – 2069 Weston Road that once housed Weston’s beer store along with the adjoining property to the rear that a generation ago, hosted white clad Weston lawn bowlers. Developer Jack Morelli mentioned the pollution that has delayed development of the property has been cleaned up but as yet the Ontario Ministry of the Environment hasn’t certified the site. The meeting wasn’t official so invites (2000 according to the councillor) were sent to a wider audience. 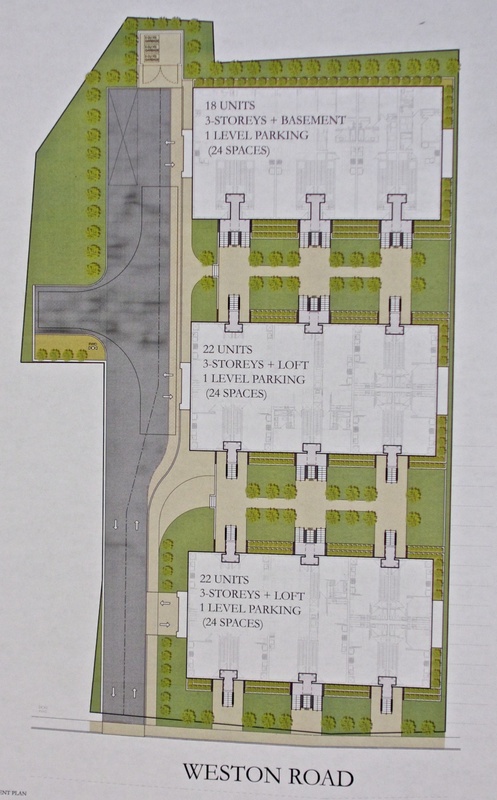 As anticipated, this little slice of Weston Road will be positively festooned with town homes; 38 of them will be shoehorned onto the site with living spaces of 1400 – 1800 square feet and will be marketed to prospective punters in the low $400,000 range. City of Toronto planner, Natasha Lang mentioned that as with any development, plans go back and forth for amendments but that the latest plan hadn’t yet been seen at city hall. She mentioned that previous incarnations of the plan had failed to meet city standards in several areas including rear yard space as well as driveway and sidewalk widths. Residents mentioned the already crowded conditions at H.J. Alexander school which abuts the site as well as concerns with lack of amenity space and the sole entrance to the development from Weston Road. Councillor Nunziata chimed in at this point to declare, ‘We’re looking at putting a recreation facility at Weston and Lawrence’. This might be wishful thinking. Westonites obviously aren’t overly concerned as the turnout was relatively sparse considering that 2000 invitations were allegedly distributed by Canada Post. Any development will be an improvement over an empty, weed infested, contaminated site. We also get that density will be increasing. However, Weston doesn’t want or need another supply of problem housing simply because the quest for short term profit is allowed to trump community building. The developers responsible for the mess that is Weston Road pocketed their money and disappeared long ago leaving all of us to cope with the resulting fallout. Let’s do this one right for a change. 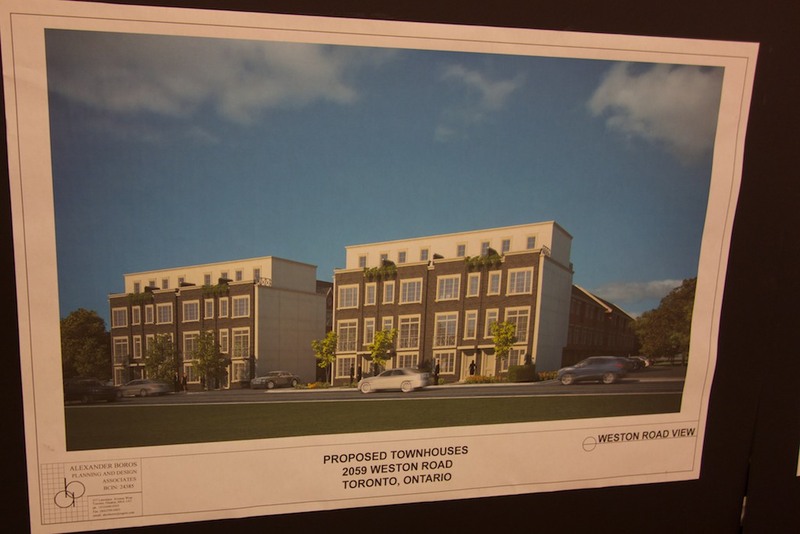 Author Roy MurrayPosted on October 31, 2013 Categories Real estate, SchoolsTags Alex Boros, Jack Morelli, Toronto, town homes, Weston Road1 Comment on Townhomes on old Beer Store site.